Global equities posted sharp declines in Q4 on persistent concerns over global trade and slowing economic growth. Government bond yields generally fell (i.e. prices rose), reflecting the broad uncertainty. US equities declined, with especially steep falls in December. The Federal Reserve raised rates, as expected. Warnings from several high profile IT firms fanned fears that earnings growth may slow. European equities also declined, with trade tariffs, slower Chinese growth and Brexit combining to form a difficult environment. Data continued to point to slowing momentum in the eurozone economy. The FTSE All-Share fell over the period, with global developments setting the tone for the market. Sterling fell in response to political noise around Brexit, with worries of a “no deal” departure from the EU coming to the fore again. Japanese equities lost value, with weakness coinciding with periods of yen strength as the currency continued to be viewed as a “safe-haven” at times of increased uncertainty. Emerging markets equities lost value with the familiar array of global trade and growth concerns weighing on returns. Brazilian equities and the real rallied ahead of the market-friendly election outcome; confirmed in late October. Bond yields were lower (i.e. prices rose) over the quarter, broadly reflecting increased risk aversion and volatility amid continued macro uncertainty relating to trade tensions, Brexit and politics in Italy. US equities declined materially in Q4 – with especially steep falls in December – due to fears over economic momentum and slower earnings growth. The US-China trade dispute also continued to hamper investor optimism. The large cap S&P 500 index outperformed the small & mid cap Russell 2500 index (-16.7%), but still declined by -13.5%. The Federal Reserve (Fed) raised interest rates in December on continued stability in economic data. The labour market remained extremely strong. However, the central bank grew otherwise more dovish in tone, signalling a more cautious view for coming months. It has revised down its “dot plot” (median rate projection), meaning it now expects two interest rate increases in 2019 instead of three previously, reflecting more cautious economic forecasts. GDP growth forecasts were revised down in 2018 and 2019, with inflation projections also adjusted downwards. Warnings from several high profile firms – particularly in information technology (IT) and most notably from Apple – also fanned fears that earnings growth may slow. IT was amongst the quarter’s weaker sectors, while energy names struggled with expectations of softer China demand that weighed on oil prices. Less economically-sensitive sectors, such as utilities, generally performed better although most areas of the market lost ground. It was a poor quarter for equities and Europe was no exception with the MSCI EMU index returning -12.7%. Worries over rising US interest rates, trade tariffs, slower Chinese growth and Brexit continue to combine to form a difficult environment for higher risk assets like shares. The defensive sectors of communication services and utilities – often perceived as safe havens due to their stable earnings throughout the cycle – were the only sectors to register a positive return. Materials and information technology were among the worst performing sectors. The period included the third quarter earnings season with company results greeted with sharp share price swings, even in cases where earnings met market expectations. Several carmakers warned that slower demand and delays to new emissions tests would weigh on their full-year results. Data continued to point to slowing momentum in the eurozone economy. The flash composite purchasing managers’ index  for December showed business activity slowed to the weakest level in over four years. The index came in at 51.3, down from 52.7 in November. The “gilets jaunes” protests in France and ongoing weak demand for new cars were among the factors weighing on activity. As expected, the European Central Bank confirmed the end of its bond-buying programme in December and reiterated that interest rates would remain on hold “at least through the summer of 2019”. December saw the end of the long-running dispute over Italy’s 2019 budget. The Rome government agreed to delay some spending measures, meaning 2019’s budget deficit will be 2.04% compared to the 2.4% initially envisaged. However, the agreement failed to quell concerns about the health of the country’s banks and financials were weak in the quarter. The FTSE All-Share retreated 10.2% over the period, falling sharply, inline with global equities. It was one of the worst quarters for global equities in many years as fears over the outlook for the world economy came to a head against the backdrop of tightening global monetary conditions, US-China trade tensions and European political uncertainty. Many UK domestic-focused sectors also performed poorly as worries of a “no deal” exit from the EU intensified after the UK published its draft EU Withdrawal Agreement (endorsed by EU leaders) which triggered another period of intense political uncertainty. Several senior and junior ministers resigned in protest at the Withdrawal Agreement, raising questions over the stability of the UK government, and the final parliamentary passage of the deal. The prime minister struggled to gain sufficient support from parliament for the agreement in its initial form, with one of the main issues being the backstop arrangement to avoid a hard border between Northern Ireland and the Irish Republic. A “meaningful vote” on the agreement was deferred until January, in turn sparking a no confidence vote in the PM’s leadership of the Conservative Party, which she won by 200 to 117. Despite the uncertainty, and the risk of a UK recession in the event of a “no deal”, the economy continued to recover from the very poor start to 2018. UK Q3 GDP growth came in at 0.6% quarter-on-quarter as expected, up from 0.4% in Q2 and the fastest pace since Q4 2016. More recent data, however, has been volatile: UK retail sales disappointed in October, falling -0.5% month-on-month, but bounced back very sharply in November, increasing by 1.4% month-on-month, which was significantly above consensus expectations. UK households enjoyed an acceleration in wage growth and lower inflation over the period. The Japanese equity market reflected the deterioration in global sentiment, and ended the quarter down -17.6%. Weakness was particularly concentrated in October and late December, which coincided with periods of yen strength as the currency continued to be viewed as a “safe-haven” at times of increased uncertainty. From Japan’s perspective, very little actually changed during the quarter. The Bank of Japan’s regular policy committee meetings resulted in no change to monetary policy, as expected. Economic news was somewhat mixed, but all the data needs to be viewed in the context of a succession of natural disasters in Japan which caused some slowdown in activity followed by a relatively strong rebound in subsequent months. After a long run of incremental positive data, there are now some signs that the rate of improvement in the labour market may be peaking out. One surprise during the quarter was the earlier than expected confirmation that the next increase in consumption tax will go ahead as planned in October 2019. There was little fresh corporate news for investors after the quarterly results announcements. However, Softbank, the communications conglomerate, did complete a significant initial public offering of its Japanese mobile phone arm, despite the poor market environment. Nissan also grabbed the headlines following the arrest of Carlos Ghosn and his subsequent removal from his position as chairman of the company. Away from the spotlight, however, Japanese companies have announced record levels of share buybacks (i.e. companies repurchasing their own shares) in the wake of their interim results, as the trend towards better shareholder returns continues. Asia ex Japan equities extended their losses in a volatile quarter for world markets. The MSCI Asia ex Japan index recorded a negative return, though it outperformed the MSCI World index. Persistent concerns over the US-China trade conflict and the pace of US interest rate hikes dominated sentiment. The darkening global economic outlook further troubled investors. Notably, China’s economy recorded its weakest quarterly growth since the global financial crisis. Industrial production and retail sales also slowed more than expected, heightening growth concerns. Policymakers responded with measures to support the economy, including cutting banks’ reserve requirement ratios and boosting credit for small and private companies. Meanwhile, the plunge in crude oil prices lifted some net oil importers; Indonesia, the Philippines and India bucked the downtrend to close higher. The Indonesian rupiah was also buoyed by Bank Indonesia’s surprise interest rate increase. In India, a widening rift between the government and the Reserve Bank of India culminated in the unexpected resignation of the central bank governor. A former civil servant was appointed as the new head of the central bank. Emerging markets lost value in Q4 as the US-China trade dispute persisted and concerns over global growth increased. The MSCI Emerging markets index decreased in value but outperformed the MSCI World. Mexico was among the weakest index markets as rising concern over the incoming government’s policies, and the implications for investment, led to a sell-off in equities and the peso. A series of public consultations were held during the quarter, the most notable of which rejected the building of a new airport in Mexico City (which is already one-third complete). The Asian EM of Taiwan, South Korea and China all underperformed with a combination of trade uncertainty, disappointing corporate earnings and technology cycle concerns a headwind. In China, Q3 GDP growth by more than expected to 6.5% YoY while higher frequency data continued to deteriorate and the authorities announced further measures to support the economy. Elsewhere, a sharp fall in crude oil prices was a headwind for several oil producing EM, notably Colombia but also Russia. By contrast, Brazil posted a strong gain as equities and the real rallied in anticipation of a market-friendly election outcome, which was confirmed with Jair Bolsonaro’s run-off victory in late October. Several markets sensitive to external pressures also posted gains, including Indonesia and India, which benefited from the decline in crude oil prices. 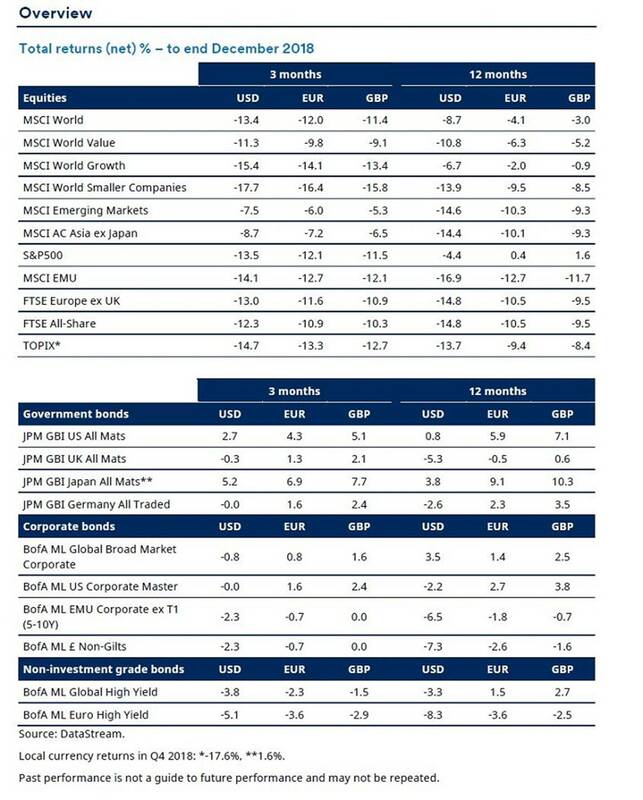 Bond yields were lower over the quarter, broadly reflecting increased risk aversion and volatility amid continued macro uncertainty relating to trade tensions, Brexit and politics in Italy. Comments from Fed Chair Jerome Powell indicated a slightly dovish shift though the Fed implemented the fourth rate rise of the year in December. US 10-year Treasury yields fell from 3.06% to 2.68%. In Europe, 10-year Bund yields declined from 0.47% to 0.24% as data remained lacklustre. At its final meeting of the year, the ECB confirmed it would end its bond purchase programme, but downgraded its growth and inflation forecasts for the year. Italian 10-year yields were volatile, but overall fell from 3.15% to 2.74% as the government reached an agreement with the EU on the budget, having reduced its fiscal deficit target to 2.04% (previously 2.40%). Brexit uncertainty was heightened as the announcement of a Withdrawal Agreement between the UK and EU drew widespread criticism. Prime Minister Theresa May took a last minute decision to postpone the parliamentary vote on the deal and soon after survived a confidence vote. Ten-year gilt yields fell from 1.57% to 1.28%. Corporate bonds had a challenging quarter and underperformed government bonds. A deterioration of risk sentiment led to the broad-based underperformance across investment grade  credit sectors relative to government bonds. High yield (HY) was weak, led down by the energy sector, particularly in the US. Emerging markets (EM) bonds saw performance improve as the quarter progressed with US dollar strength waning and currencies of oil exporters benefiting from weaker energy prices. The MSCI World index lost 13% over the quarter. Balanced convertible bonds, as measured by the Thomson Reuters Global Focus hedged US dollar index, ended the quarter with a loss of -4.7% and hence protected investors from 65% of the equity downside. With equity market losses, the characteristics of the convertibles market changed once more and many of these securities are trading much closer to par value with significant potential upside. At the same time, valuations of convertibles bonds cheapened slightly. European convertibles remain slightly overvalued while discounts can be found in Asia and Japan. The S&P GSCI Index fell sharply, primarily due to the large decline in the energy component. Crude oil prices declined heavily on concerns of oversupply in the face of a weakening outlook for global demand. The industrial metals component was also weaker, as deteriorating Chinese macroeconomic data weighed on demand expectations. Wheat and cotton prices fell but cocoa and sugar recorded positive returns. Precious metals prices posted solid gains as global growth concerns spurred demand for traditionally safe-haven assets. This entry was posted in News on February 1, 2019 by Abigail.